Flint is a new Inhuman created as a result of the T-Bomb (Terrigen Bomb). 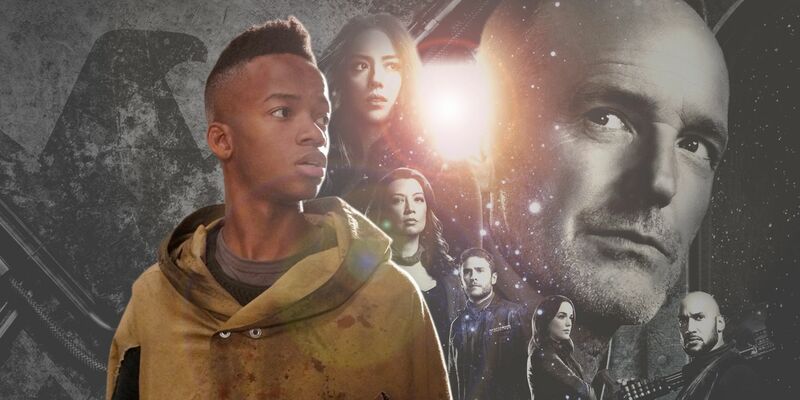 Flint will appear in the Agents of SHIELD season 5 and will be played by actor Coy Stewart. Jason is a teen who was adopted from Africa by a white family in rural Minnesota. He often feels out of place being the only African American in the entire town. He is hoping to move from the town and go to college elsewhere when the Terrigen cloud is released by the T-Bomb. Jason had just had a major fight with his adopted father. The two were apart and Jason was stewing his room. His father then burst through the door saying it was emergency and they had to go away. The entire town evacuates in an attempt to outrun the Terrigen cloud. Jason asks his Dad what is going on. His father replies cryptically that the entire town is from a special tribe, and that Jason came from a similar tribe in Africa. Members of their tribe will be changed by the cloud that is headed their way and he does not think any of them will survive. The cloud hits the towns caravan and they all become encased in cocoons. When Jason emerges from his cocoon he finds he is the only one from the town left alive. Shortly after emerging from the Cocoon an older and powerful Inhuman named Lash appears and takes Jason to his city Orollan. Lash is recruiting new Inhumans to repopulate the Inhuman city. Not long after arriving in Orollan the city is attacked by Queen Medusa and her forces. The armies of Inhumans collide and quickly Medusa gains the upper hand. She does not hurt any of the Orollans but instead bring forward the Inhuman Lineage to explain the motivations of Blackbolt to Lash. Lash then relents and agrees not to kill any more Inhumans for the time being. Jason decides to leave and go to New Attilan. In New Attilan Jason studies beneath the Inhuman trainer Gorgon on how to use his powers. He takes the name of Flint as his NuMan name. When the Unspoken manages to take over New Attilan, Flint is instrumental in retaking back control of city. He uses his power to fly the Terrigen crystals away from the Unspoken depleting his power. Flint has become close friends with the other NuMans Dante AKA Inferno and Naja. Geokinesis - Flint can control / move rocks with his mind. He also has some stone in his body which makes him heavy. Flint appears in Agents of SHIELD Season 5 and is played by actor Coy Stewart. Coy Stewart is most known for his role in Bella and the Bulldogs. 70 years into the future Earth is destroyed and The Lighthouse space-station houses what is left of humanity. The station is controlled by ruthless alien Kree aliens who use their human population to create Inhumans whom they sell to various nefarious alien powers. One of the Inhumans created on the station is Flint who has the ability to control Earth. In the episode "The Last Day" it revealed that Flint is important to the prophesy in which Earth is saved from destruction.